A firewood and coppice merchant based at Crondall near Farnham was the first business to win funding from the previous Loddon and Eversley LEADER Local Action Group. A grant of more than £4000 made to firewood and coppice merchant Mark Howard has enabled him to buy a new machine to process firewood. Production of firewood accounts for up to 65% of his business. 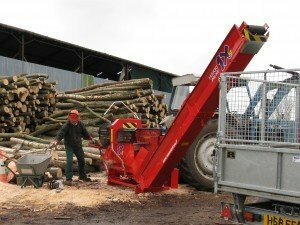 Mark explained the need to update his machinery: “The increased demand for wood fuel has developed because consumers are looking for a green or carbon neutral alternative to fossil fuels, or to supplement their heating bills by installing log burners. As a result our firewood business has grown by almost 100%. We promote our business as ‘local wood for local people’, as all our timber is sourced from local estates either from managed forestry or coppiced woodland”.